A welcoming, friendly church with a congregation of about 30, of all ages. Premises are attractive and well maintained. The church seeks to work actively with the other churches in the village and in neighbouring villages. There is a thriving Sunday School. 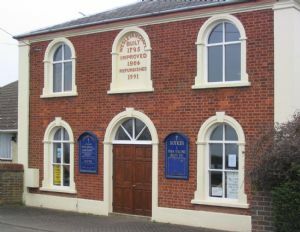 The chapel is a listed building. Services are every Sunday at 10.30am. Café Worship takes place on the Sunday after the 2nd Saturday of the month. We hold a prayer meeting at 9.30am on the last Sunday of the month. Monthly coffee mornings with light lunches are organised for the 2nd Saturday of the month during October and November then from February until May, from 11am until 1pm. Two house groups meet monthly during the week.